The month of May is particularly rich in the Church’s liturgy. The whole month is consecrated to Mary. There are men and women throughout the world who love Mary since she is the mother of Jesus, our Savior, the mother of God, our creator, the mother of the Church, our family, and the mother of all men and women. I’m always happy and moved when I see someone who prays, who cries or talks with Mary, in front of the beautiful image of our Lady of Guadalupe which we have in Saint Sebastian’s. Mary is our mother and she listens to the prayers of her children. Don’t be afraid to spend some time with her. She will fill you with peace and strength to continue in the path which the Lord has proposed for you. 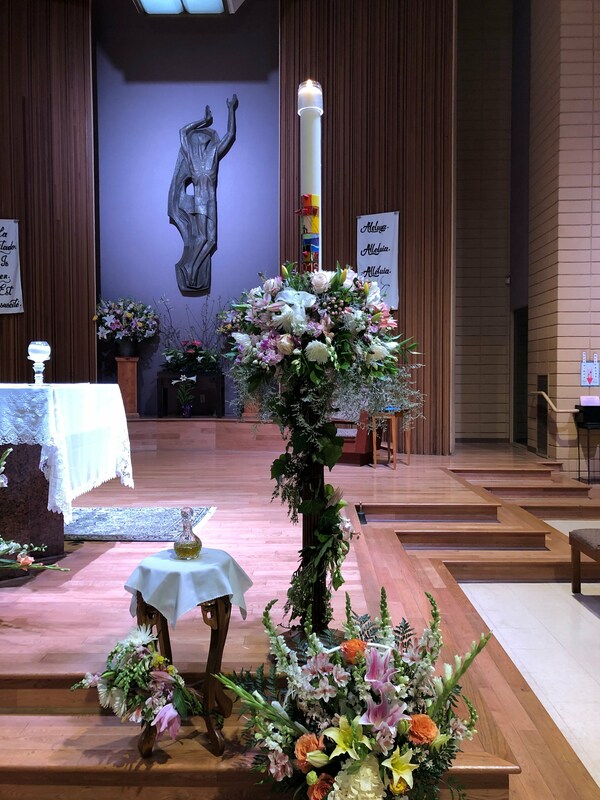 On May 1st we also celebrated the Feast of Divine Mercy. At the same time, Benedict XVI declared John Paul II the Great Blessed. Let us take advantage of this month to pray for all those who do not yet know about the love, compassion and mercy of our God. John Paul II, who visited 127 countries during his pontificate and who made the last trip of his life to Lourdes as a sick pilgrim. He consecrated his pontificate so that all humankind would discover the mercy, love and goodness of God. May John Paul II continue to pray with us for the well-being of all humanity. The month of May is also the month for First Communions. In our community these will take place on Sunday, May 15th, for those of our parish who speak English and Spanish and for the school children. On May 22 we will accompany the French-speaking children of our parish in their first Communions. On Sunday, May 29th (at 12 noon), we will have the pleasure of receiving Bishop Edward Clark (Auxiliary Bishop of Los Angeles, responsible for our pastoral region) who, by means of prayer, anointing and imposition of hands will transmit the Sacrament of Confirmation to the youth of our parish community. All the events that we will celebrate together can help us to grow in faith and to integrate ourselves more each day into the community which welcomes us and allows us to encounter the Lord and share the joy of faith with our brothers and sisters. In this month of May I invite you to pray for each other so that all of us will feel responsible for the mission of our community and so that each of us will live the sacraments that we receive, with joy and trust. El mes de mayo es particularmente rico en la liturgia de la Iglesia. Todo el mes está consagrado a Maria. En todo el mundo hay hombres y mujeres que aman a Maria ya que ella es la madre de Jesús, nuestro salvador, la madre de Dios, nuestro creador, la madre de la Iglesia, nuestra familia y la madre de todos los hombres. Siempre me alegro y me emociono cuando veo a alguien que ora, que llora o que habla con Maria por medio de la hermosa imagen de Nuestra Señora de Guadalupe que tenemos en San Sebastian. Maria es nuestra madre y ella escucha la oración de sus hijos. No teman pasar un momento con ella. Ella los llenará de paz y de fuerza para avanzar por el camino que el Señor les propone. El 1º de mayo celebramos también la fiesta de la Divina Misericordia. Al mismo tiempo, Benedicto XVI declaró Beato a Juan Pablo II el Grande. Aprovechemos de este mes para orar por todos aquellos que no conocen todavía el amor, la compasión y la misericordia de nuestro Dios. Juan Pablo II que visitó 127 países durante su pontificado y que hizo el último viaje de su vida a Lourdes como peregrino enfermo, consagró su pontificado a trabajar para que toda la humanidad descubriera la misericordia, el amor y la bondad de Dios. Que Juan Pablo II siga orando con nosotros por el bienestar de nuestra humanidad. El mes de mayo es también el mes de las primeras comuniones y de las confirmaciones. Las primeras comuniones en nuestra comunidad tendrán lugar el domingo 15 de mayo para los niños de la parroquia que hablan inglés y español y para los niños de la escuela. El domingo 22 de mayo acompañaremos los niños de la parroquia que hablan francés en su primera comunión. El domingo 29 de mayo (a las doce del día) tendremos el gusto de recibir al obispo Mgr Edward Clark (Obispo auxiliar de Los Angeles encargado de nuestra región pastoral) que por medio de la oración, de la unción y de la imposición de las manos transmitirá el sacramento de la confirmación a los jóvenes de nuestra comunidad parroquial. Todos los eventos que vamos a celebrar juntos pueden ayudarnos a crecer en la fe y a integrarnos cada día más en la comunidad que nos acoge y que nos permite encontrar al Señor y compartir con nuestros hermanos y hermanas la alegría de creer. En este mes de mayo, los invito a orar unos por otros para que todos nos sintamos responsables de la misión de nuestra comunidad y par que cada uno viva los sacramentos que recibe con alegría y con confianza.